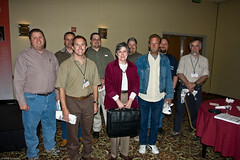 I had a blast attending the AUGI CAD Camp yesterday in Salt Lake City Utah with about 200 other people. There were a bunch of familiar faces and great classes. I snuck into most classes as well as snapped a few photos even in the low light. 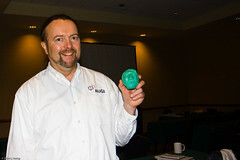 Matt Murphy got to see his world traveling Matt Murphy Clay Head Sculpture in person for the first time since Autodesk University 2007. Plans are being set to take the Matt Murphy Clay Head Sculpture to more CAD Camps as well as to Autodesk University 2008. Congratulations to Penni Cromar for winning the Top DAUG competition as well as the other 9 people placing and getting prizes.. 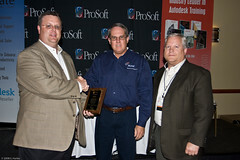 I wanted to give a big special thank you to ProSoft for sponsoring the Salt Lake AUGI CAD Camp. Everyone celebrating and honoring the US holiday Memorial Day Weekend, please be safe.